My least favorite stuff is washing and blow drying my hair, but my favorite stuff is twisting my fresh and shiny hair into a soft cinnamon bun or ballerina twist. Why is washing my hair a least favorite task? Although I only do a full wash and blow dry every 7-10 days, it’s a major production because my hair is extremely long, medium to thick and has natural curls interspersed with waves. It’s taken me 20 years of trying a wide range of cleansing techniques to get a great wash down to an art. While I know it’s best for my hair to be plopped, diffused and air dried to enhance my curl and waves, I enjoy the feel of soft barely there waves cascading down my back. My favorite stuff? I love to wrap my hair into an array of twists which are easier to achieve when my hair is only slightly wavy and not so much when its super wavy or curly. Although I always want to avoid it, sectioning my hair before I diffuse or blow dry is key for me to achieve the results I love. Even air drying turns out better when I have carefully arranged my part and sectioned my hair the way I want it to ultimately cascade when it’s dry. 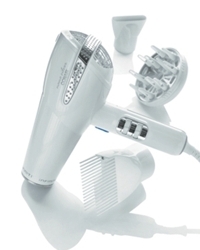 Listed below are my own sectioning tricks for perfect blow drying every time. These tricks work well for anyone with medium to very long hair that is straight, wavy or slightly curly. 1. Use A Rinse Out Conditioner – Always use a rinse out conditioner in the shower after you have applied the cleansing formula or your choice. I alternate between Conditioner Only (CO), Diluted Shampoo (DS) and Water Only (WO). Even if you want to avoid weighing down fine or thin strands along the roots it is best to apply from the ears down to the ends. 2. Detangle In Shower – After applying the rinse out conditioner, but before rinsing, use your fingers or a smooth wide tooth comb to detangle. This is the most painless way to remove snarls, snags or, little angle knots. Take your time and work slowly from the ends to the roots. 3. Rinse – Once you are completely detangled, rinse out the conditioner allowing a teeny tiny bit to remain from the ears down. Allowing a slight residue gently coats strands and keeps them soft and frizz free. 4. Splash With Cool Water – Finish with a cool to cold water rinse. To avoid freezing your body, have a clean gallon jug of cool water available to use. Lean over so only your hair is in the path of the cool water and pour it completely through. This step adds shine and shimmer. 5. Gently Squeeze Out Excess Water – Use fingers to gently squeeze excess water from your dripping strands. Don’t pull but gently press your fingers up and down the strands like you’re playing an accordion. 6. 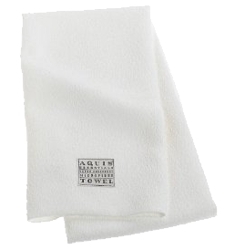 Towel Blot – Use a thick water absorbent towel. Don’t rub since this can damage fragile strands. You don’t want to apply your styling cocktail to dripping strands or the product will be diluted or drip off into your towel. 7. Have A Cocktail – Once hair has been blotted dry apply your desired styling cocktail. I combine a leave-in conditioner with a defrisant cream. If I want super straight strands I might add a straightening cream as well. Again it’s best to apply the products from your ears down with your fingers or a smooth tooth comb to make sure its well distributed. If you need support at the roots then go ahead and apply it there but unless necessary, concentrate on the lower sections. Create the styling cocktail designed for your own hair which might include a volume enhancing mousse or texturing creams. 8. Section Strands – Using your fingers or a smooth tooth detangling comb separate into 4 or more equal parts. You can actually do more than four, but my own hair works best with one section on either side and two in the back. 11. Round Brush Finishing – After finger picking use a 100% boar bristle brush or similar and start at the ends of the hair where the tresses dry fastest. 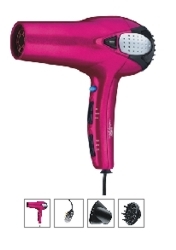 Pull brush through hair as you point the blow dryer nozzle down from the roots towards the ends. Pull hair taut as you direct the air flow along the strands. 12. 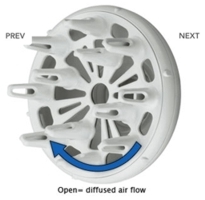 Cool It Down – Once each section is almost dry use the cool setting or button on your dryer to cool off the newly dried section and allow the hair to set. Use the cool option for at least 60 seconds. 13. Roll – Once the section is completely dry roll it around a very large smooth roller and clip to the scalp. Or use your fingers and roll a big curl you pin to the scalp. 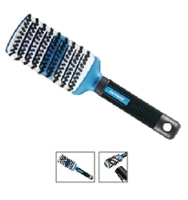 This allow hair to set with some volume and shape. 14. Unpin – Once all the sections are dry and set unpin. Tousle gently with fingers. Do not use a comb or brush other then to gently deconstruct or you will lose the newly created lush volume. 15. Finish – Add a tiny drop or two of shine serum to the palms of your hands. Massage well and then brush lightly over the top of your strands. Remember that a little bit goes a long way. Finally you are finished with the hard work but now you will have gorgeous strands you can enjoy. Use tricks to extend your beautiful first day hair into second, third or fourth days before needing a touch up water rinse or a dry shampoo treatment. Spending the time to cleanse, section and blow dry will help you have a long and happy hair week. If you have really long hair like me you know it’s not great to use heat on a regular basis. Since I only do a full cleanse on my hair every 7-10 days, I do alternate my blow dry sessions with air-drying and long finger diffusing. But that’s another blog for another day. This entry was posted on Friday, January 7th, 2011 at 8:05 am	and is filed under Beauty Beat, Celebrity Bites, Grooming, Hair, Hair Styling Tools, Hairstyles, Hairstyling Tips, Long Hair, Shampoo Treatments. You can follow any responses to this entry through the RSS 2.0 feed. Both comments and pings are currently closed.